A team of developers based in Nice, France have created a new affordable and simple to use underwater breathing system that allows you to have 15 minutes under the waves on a single charge. Available in two different versions the Seagow 200 provides up to 10 minutes of air at 200 Bar or 3000 PSI, while the larger Seagow 300 provides up to 15 minutes of their at a pressure of 300 Bar or 4500 PSI. 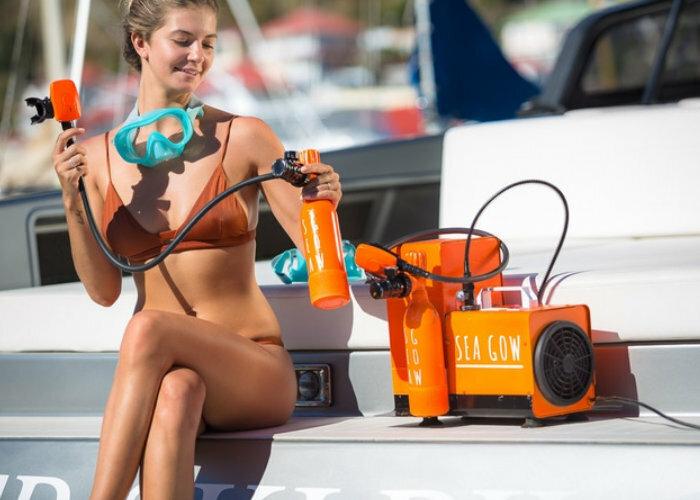 Watch the demonstration video below to learn more about the Seagow breathing system and compressor which is used to recharge the diving air bottle when required. Seagow has this week taken to the Kickstarter crowdfunding website to raise the required funds it needs to make the jump into production. Obtaining its pledge goal thanks to early bird backers with still 28 days remaining on its campaign. Available from $149 for super early bird backers the Seagow 200 is available at a 55 percent discount until the end of the Kickstarter campaign. The larger Seagow 300 is available with a compressor at a discounted price of €559 or approximately £496 with shipping expected to take place during June 2018.